Kopaonik, the highest mountain in Central Serbia, spreads its wide ridge with a length of 82 kilometers, in the direction of the hills above the Kosovska Mitrovica, north-west through a series of peaks higher than 1,600 meters, to the highest part of the massif called. Ravni (Flat) Kopaonik with peaks: Gobelja (1934 m), Karaman Vucak (1936 m), Dried Rudiste (1976 m) and Pancicev vrh (peak) (2017 m). To Kopaonik you can reach from several directions. Over Josanicka banja (Spa), Brzece and Rudnica. All three directions are roads with good quality and are regularly cleaned during the winter period. Road over Brzece is commonly used by guests who are traveling the highway Belgrade - Nis and therein lies one of the most difficult sections of Jaram - Rendara. Road through Josanicka banja and Rudnica is used by guests who are coming using the road called Ibar and both approaches are a bit more approachable. Perhaps the least used approach is via Rudnica that is the shortest and tamed road because it is on the southern side of the mountain. No matter which direction you are taking, we recommend mandatory use of winter equipment and winter tires. Local people offer mounting chains for 500 dinars on all approaches to Kopaonik. “Arm” yourself with patience and drive safely. After arriving to Kopaonik, the first novelty that you will notice is the existence of parking place, it costs 200 dinars per day. Of course, there will also be unavoidable local residents who offer their “services” and that leave a bad impression of the mountain generally. Our recommendation is to pay for parking and leave your car in a safe place without undue aggravation. We sincerely hope that by the next year there will be several parking places and all of us will gladly pay 1400 dinars for a seven-day safe parking. Next thing that is still missing, and what is the jurisdiction of the municipality of Raska, is parking at the site of the initial lift station Sun Valley (Suncana dolina), which would incomparable relieve the center of Kopaonik from guests vehicles that are accommodated in a cottage-colony (Vikend naselje). Start station of the Sun Valley is now on the main road, 1km away from the first buildings in the weekend settlement. Also, for the second year in a row, we urge the authorities to consider the idea of introducing ski bus from the village to Gobelja which would also relieve the center of Kopaonik, but also encourage fulfillment of ski area, especially Gobelja considering that you can get to four-chair lift using two plates and two extra ski lifts that have a lot less bandwidth. In the last 8 years thru state investment, ski resort Kopaonik has become the best example of how you can make in Serbia a step forward to European standards. We responsible argue that today ski area is most criticized only by those who probably never seen foreign ski centers. We do not want to be misunderstood there are still plenty of things that can be improved and we will indicate them in this paper, but the general impression is that the ski resort Kopaonik is side by side with the European ski resorts. Of course, when we say side by side, it refers to the organization and design of the ski resort, and not on the natural characteristics, the height of the ski center, the length of the path, altitude differences and some things that we just cannot change. Nature has given us such mountain and we all o together must get the maximum of it. Ski area stretches at altitudes from 1100 up to 2017m and has 24 installations, which can transport 30 000 skiers per hour. Seven four-chair lifts, three six-chair lift, two two-chair lifts, nine ski lifts and three extra ski lifts serving 55 km of alpine and 12 km of Nordic tracks. Last year, resorts had received and approval of the International Ski Federation (FIS) for three runs at the ski resort Kopaonik, which confirms that the tracks correspond to FIS standards. This will allow the organization of international competitions in alpine skiing and snowboarding disciplines. The guest who last visited Kopaonik 8 years ago today probably would not recognize a large part of the resort. 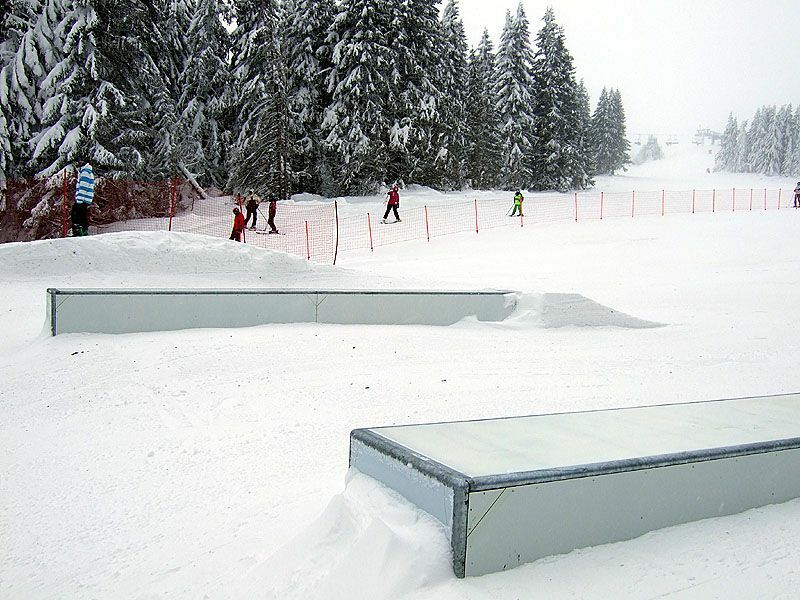 Kopaonik got 12 new installations, 12 new tracks have been created and a good part of existing slopes have been expanded. Existing water accumulations was restored and enlarged on Mali Karaman and two new have been built at Crvene bare. Presently there are 315 launchers and guns on all slopes except at the Bele reka slope. Labelling and signalization were once the greatest defect of Kopaonik, which caused many injuries and losing on the mountain. We can safely say that today Kopaonik has great signalization and marked ski resort, probably better than many European ski resorts as we confirmed it in an interview with members of the Mountain Rescue Service who have far fewer interventions related to lost skiers. At the most critical and dangerous places were set up protective nets and padding, with the aim of increasing safety, an area for snowmobile was specified where they can be used. Compared to other ski centers perhaps it seem to be too much looking from the safety if it’s possible. Kopaonik is one of the few ski centers where with the purchase of ski pass, it offers full health care in the Clinical Center of Serbia (KBC), GSS services and ski insurance in case of injury. The Ministry for Internal Affairs of Serbia, at the Clinical Center, provides a transport service for injured skiers and helicopter. In places where the wind refers snow, a large number of wooden snow stops were installed, last winter in the conditions of heavy snow and wind, they were very useful (Gobelja, Pancic ...). Also, every year, there has been a qualitative leap in culture, manners from the workers in resort. What was once unthinkable is now reality. The basket are being cleaned before skiers sit, in case of bad weather, if there are no skiers, they are immediately closing, workers are incomparably more polite and always at your service, passing popular plates and anchors. One of the things that should be considered is how better organize the rows and occupancy of chair lifts. The system for artificial snow has showed its potential during last season in conditions with extremely low level of snow. However, it is clear that three reservoirs mentioned above, are not sufficient to make enough snow on track in terms of small snowfalls which was clear at the beginning of the winter season. The lack of water prevented ski resort running on time. We need to be realistic and recognize that Kopaonik needs more reservoirs. That would permit the start of the whole ski area much earlier. Therefore, it is necessary to solve the problem how to supply sufficient amount of water for the entire ski resort. Many of today normal things once seemed like science fiction, but today it’s the real situation at Kopaonik. Why then not to expect to ski from November to May in seasons to come? Track improvement was raised in a much higher level last season. Resort workers were sent to training in foreign ski resorts, and Ski resort of Serbia bought new ski vehicles for snow including vehicle with winch for the steepest slopes. The combination of artificial and natural snow and anti-erosion works done during summer time resulted very good ski track during ski season. It should be noted that in bad weather conditions (high temperatures and south wind) and at altitudes below 2000 m altitude holding all day long good quality of snow tracks with a high volume of skiers is practically impossible. The only way is to find modalities how to equally load the whole ski resort. 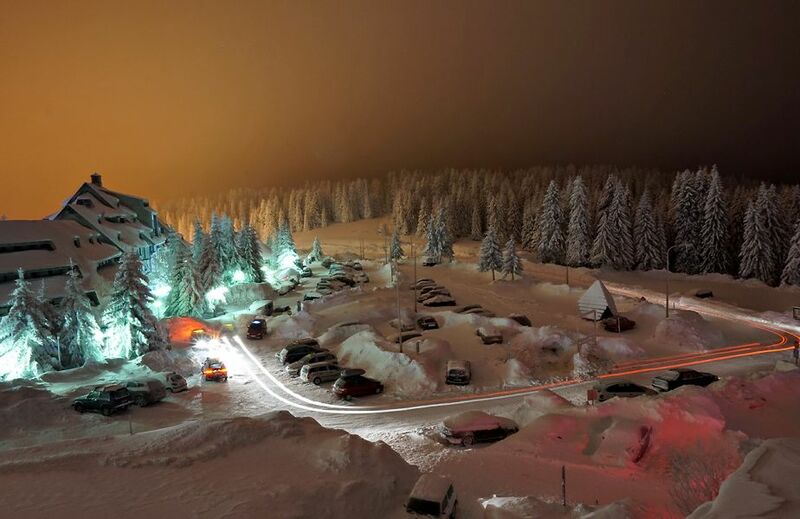 The fact is that almost 50% run in the ski center Kopaonik is at Karaman greben. Here we return to the beginning of the story and the construction of a parking place near Suncana dolina, introducing ski bus from Weekend resort to Gobelja as well as the perspective of building a gondola from Brzece. We sincerely hope that the idea of financing 50% from the state and 50% from the municipalities Brus and hoteliers from Brzece will make this happen, as soon as possible. On the right track near lift called Krst, modern Snow Park has been build. That way Kopaonik gained and joined group of modern ski resorts. In perspective, if a half pipe is built, Kopaonik will have the ability to maintain the prestigious competitions in extreme sports. Sport valley got quality lighting and quality skating place which is another plus in the variety at Kopaonik. In order to show that ski resort of Serbia is listening to wishes of advanced skiers, is the fact that for the first time since 1994, put into operation ski track called Ledenice. As soon as the weather conditions are created, slopes Bela reka, Gvozdac, Krcmar, Gobelja are also opened and maintained. At the top of slope Gvozdac , an extra ski lift is placed in order to enable easier extraction of skiers from the slope. From the 2012/2013 season vehicles with winch was purchased as promised, as a part of the machinery for the ski slopes, that will further contribute to this enviable quality of steep slopes. During the season 2011/2012 for the first slope Suncana dolina has been in operation. The construction of two more slopes next to the ski lift continued positive trend in the construction of Gobelja that next to one ski lift more slopes have been made. So today Gobelja has six slopes and Suncana dolina three. All this adds a whole new dimension of skiing at Kopaonik. For the first time in the history of skiing at Kopaonik, ski resort in the period of high traffic starts to work half an hour earlier (8: 30h to 16:30) and were first introduced discounts for group ski passes (10%) and 15% discount in the promotional Sunday. Kopaonik has over 120 ski instructors organized into three ski schools that are licensed for ski training (Body and Health, La Scuola di Schi, Snow Star Team and MM). It is very important that the first steps in the snow are done with ski instructor. That is why, before the end of this report, we have to look at the culture and mentality of skiers from Serbia. It is necessary that each chooses ski slope according to its ski knowledge, to take care about themselves and about the other skiers to fill the lifts and form rows with the help of Ski Resorts workers. People are not aware of, or have no inner sense of how fast speed is developed at the snow. The speeds are such that injuries can be dangerous and life threatening. So be careful, a Serbian Ski resorts must be as rigorous towards unscrupulous and arrogant skiers. Let's hope that the new radars on the trails help in raising awareness of skiers. Things are going in a very good direction and we hope that next year Kopaonik will get even more water reservoirs and that it will be continued with the implementation of the Master Plan. However it is necessary that other entities of the tourist offer follow a positive trend that triggers Ski resorts of Serbia. One must know exactly their responsible and what are the procedures for resolving potential problems. And finally, to repeat a modified sentence from last year's report: We must all be aware of the geographical location of Kopaonik, that the ski tradition in Serbia is not long, that the mentality of our people, both tourism workers and guests variable, but we have to admit that Kopaonik every year is progressing towards modern European ski center and this must be clearly acknowledged.